Almost 6 months ago one of the most well known cajon makers: Sela approached our company Paul Jennings Music LLC to ask if we would like to bring Sela cajons to North America. After receiving our first sample cajon from them which was a CaSela Professional Snare cajon in the Satin Nut finnish, I was totally blown away by its sound and quality. 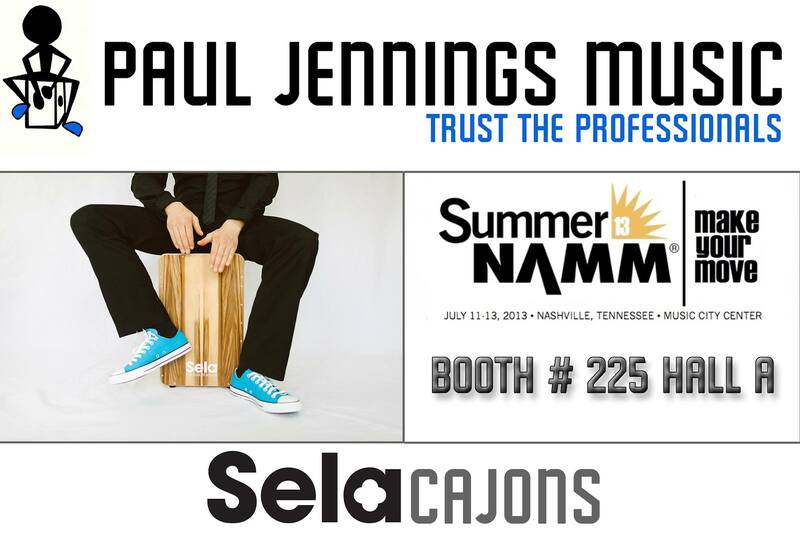 We are now pleased to announce that we will be showcasing Sela Cajons at the Summer NAMM Show in Nashville, TN on the 11th – 13th of July. We will be located at booth #225 in Hall A. If you will be in attendance come and see the incredible Selas for yourself. Here is a bit more info about why Sela make one of the most revolutionary percussion products in the world. The CaSela Professional Snare Cajon is a pro quality cajon which is screwed together quickly and easily. It combines Sela‘s many years of experience making cajons with highly modern production methods. This opens up entirely new visual and acoustic possibilities. The precisely finished components are “Made in Germany” and are of the highest quality. What makes the CaSela Professional Snare Cajon such a marketable product is that with its low production costs the Professional Quality cajon can now be offered at a lower price to the consumer. This gives the retailer a huge opportunity to sell the Selas over other professional models. 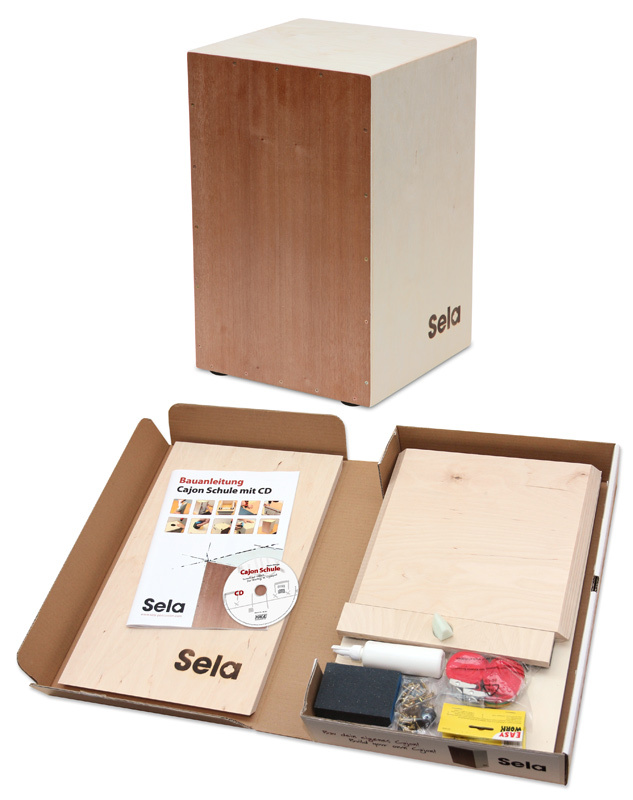 With the Snare Cajon Kit from Sela you can build a great sounding cajon in very short time while having a lot of fun. You don‘t need to be a gifted craftsman because the precisely prefabricated parts make the assembly very easy. Each step is well documented in the included manual. After about three hours your cajon will be ready to be played on. Even if you have never built a cajon before you will have a professional instrument that sounds amazing with its deep bass and crisp snare sound and is fun to play. This cajon is aimed at beginners but it gives you by no means a beginner sound. The Snare Cajon Kit by Sela is one of the best sounding cajons in its price range in the world. For more than 10 years Sela has been successfully producing extraordinary cajons of the highest quality for both amateurs and professionals. Sela are now regarded as one of the best cajon makers in the world. After years of development, Sela have produced two truly unique products. The CaSela Professional Snare Cajon and the Snare Kit Cajon. Come meet us and try Sela Cajons for yourself in Nashville this July. These days there are many lessons & videos out there for the cajon but most people are really just looking for a starting point. 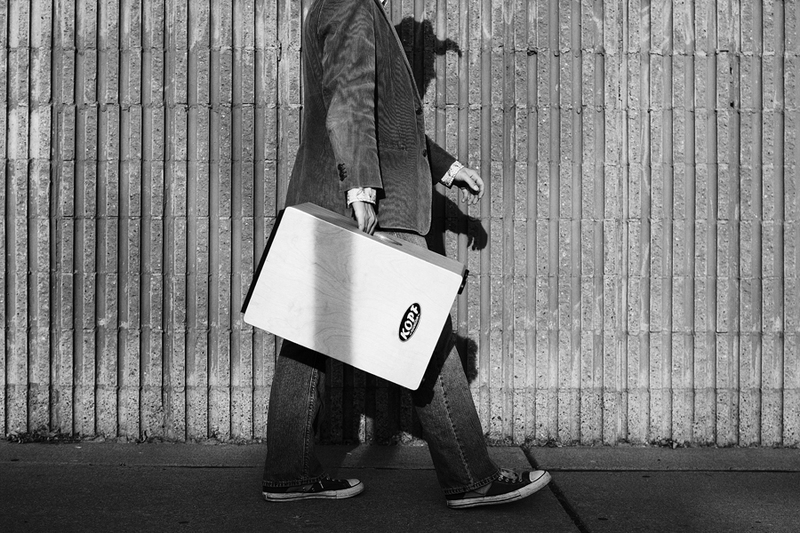 Here are 10 things to get you going as a beginner cajon player. 1. Find yourself the right cajon. There are literally hundreds of cajon makers out there today. Some are big names in percussion like LP or Meinl. Some are lesser known specialist cajon makers like Kopf or Sela. It can be daunting figuring out which one is right for you and a lot of it can come down to budget. Beginner models start usually around $70 – $120USD, mid-range: $130 – $300 with pro cajons being $300 – $500 and upwards. Do some looking around there can be some amazing deals out there especially with the lesser known names. Here’s some more info on choosing the right cajon. When I say find a teacher I am not talking only of a one-on-one human encounter. Your teacher may well come in the form of YouTube or some other video platform for lessons. There are lots of them out there and the internet has made it very easy to access a wealth of knowledge for all manner of subjects including cajon lessons. Some sites you may want to check out include: playcajon.org (shamless plug!) Heidi Joubert’s cajonbox.com and Ross McCallum’s Cajon Groove Guide. With the nature of the cajon and the way it is played, it is of the highest importance that you are not only sitting right but also playing without straining your self. Make sure you are sitting with your back straight for the most part, not hunched over but relaxed. It is not necessary to play much further than 8″ down the front of the cajon. All tones including the bass tone can be achieved right there. Paying close attention to this particularly in the beginning will greatly help your playing technique, speed & agility, and will also reduce fatigue and back pain. This is very important. If you dont stretch there is a good chance you will do yourself an injury and that will be a major setback. Here are some basic hand stretches. Your first practice sessions with your new cajon should focus heavily on finding the basic tones of the cajon. The bass tone & the slap tone are the main two. I also teach a mid tone which is achieved mostly with the tips of the fingers while the hand is in a long cupping form and a high slap tone, achieved with the tips of the fingers on the top edge of the cajon. Through out your whole career as a cajon player or percussionist you will want to improve and refine your tone on your instrument. Practicing with a metronome will greatly improve your accuracy in timing & speed. This may annoy the hell out of you at first with the mind numbing click but as you go on you will grow to love it as you can throw all kinds of timings off and all over the click of the metronome. Here’s a free online metronome. You will advance greatly if you work on the same things every day so make sure you repeat the same exercises on a daily basis. Do your stretches and warm-ups then take time on each thing that you are working on. Once you feel you are comfortable on those techniques, move on to new ones. It is very tempting to try to push the speed envelope as soon as possible. We are drummers so we have this burning desire deep inside to be fast at our chops. This is great but if we don’t take our time to achieve that speed in a gradual way or speedy fast licks will be sloppy and disapointing to us and all our friends. Take your time to develop your speed in a measured way. Noch up your metronome only when you feel that you can go on forever playing what your playing. Also, make sure to notch up the speed gradually maybe 5 BPM at a time. This will ensure your success are becoming the fastest cajon player there ever was. The most hired drummers & percussionists today are those of us who can play different styles. If you are in a super successful rock band making millions skip to number 10. The cajon was invented in the Afro-Peruvian tradition so I would highly recommend learning some of it. Not only do we all owe it to the Afro-Peruvians for inventing the cajon but it is also a very cool style of music with all kinds of great grooves to learn. Flamenco is a huge one and very fun to play on cajon. You could start by learning some basic rumba patterns and work your way up to Bulerias. Learning diferent styles as a percussionist is invalubal and along the way you will learn all about new cultures and traditions. I can’t recommend enough. One of the most important ways to further your musicianship is to play with others. You will learn much faster when you can bounce ideas off others and get a feel for playing in a group. If you don’t know where to start look into local drumming groups. There are some in every town these days or if you know some other drummers or musicians, start something yourself. Playing music with others is why we do it. It’s a great way to have a lot of fun and build community. In the mid 1970’s a Brazilian percussionist called Rubem Dantas was on tour in South America performing with flamenco guitarist Paco De Lucia. 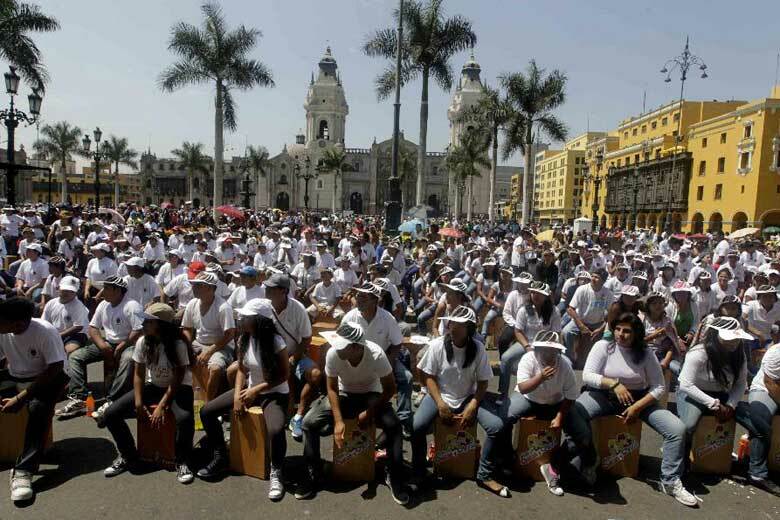 While in Peru Dantas was given a box drum by a local drummer. This instrument was a cajon and although he did not know it yet Dantas was about to spark a movement that would later see the cajon becoming one of the worlds most popular percussion instruments. The CaSela Cajon by Sela is one of the worlds most popular modern cajons. After returning from Peru Dantas began using the Cajon with De Lucia and word of this new instrument soon spread with flamenco musicians all across Spain wanting to get their hands on one. The sound of the cajon was a great accompaniment to the flamenco sound but it was not yet perfect. The traditional Peruvian cajon has no snare sound at all, it is simply a wooden box with a very open and resonant sound which is great for the traditional Afro-Peruvian music of coastal Peru but something was missing for the flamenco players. Soon after the cajon was introduced to flamenco, guitar strings were added to the inside and placed on the back side of the playing surface. The addition of the guitar strings resulted in a vibrant rattle effect which added a new dimension to the sound of the cajon. The flamenco players were now happy with the way the cajon complimented their music and the cajon went on to become one of the main instruments in flamenco music, in fact it would be hard to find a flamenco ensamble today that did not use the cajon in their performance. The addition of the guitar strings on the cajon not only made it fit into flamenco music easier but had also turned it into a drum that sounded a lot like another instrument, the drum set. This revolution in sound made it possible to have one very portable drum that sounded like a bass drum & snare drum with many more tones in between. When people began realizing that in this one box, which also doubled as your drum stool, was an entire drum set, drummers around the world began using the cajon in all kinds of musical genres from rock to traditional Scottish music. Many cajon makers have now added a multitude of snare systems to cajons and new inovations like cable bass pedals made spesificly for the cajon are coming out all the time. Sales for cajons have increased dramatically in the past 10 years and there is no sign of that slowing down anytime soon. The cajon is now hugely popular in asian countrys like Indonesia, Japan & Singapore and sales in Germany alone almost surpassed that of guitars last year. The cajon revolution is now growing in America too with tens-of-thousands sold each year and dosens of brands to choose from. Today artists such as Maroon 5, Stevie Wonder, Shakira, & Zac Brown Band use the cajon in their live shows and the cajon can regularly be seen on TV shows such as American Idol, The X Factor, & The Voice. So how did this simple box drum which was invented by slave musicians in Peru in the early 1800’s become such a hit with musicians across the world in 2013? The answer to the question lies probably in its drum set like sound and portability, but maybe its just that people are simply awestruck by the scope of sound that is possible from a simple wooden box.